Microsoft has today shown its latest emoji support for those signed up for Windows Insider builds. Supporting all the new emojis approved as part of emoji 11.0, new additions include a foot, frisbee, swan, lobster, and skateboard. This release also replaces the previous 🔫 Pistol emoji design with a water pistol / squirt gun as the company indicated would be the case back in April 2018. Above: A new green toy pistol design replaces the realistic weapon in the next Windows 10 release.. 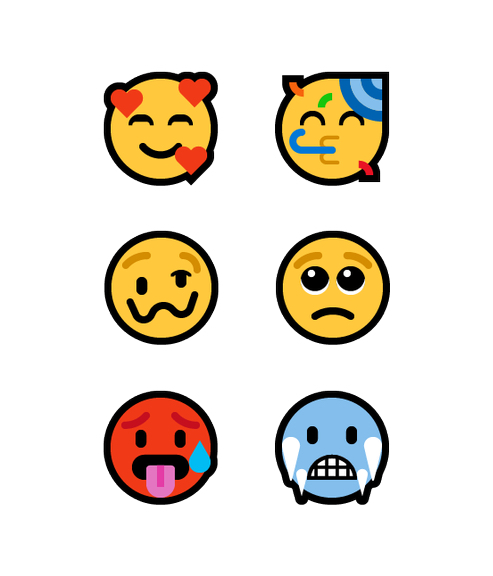 Above: All six new smileys from Emoji 11.0 are included in the latest Windows 10 Insiders build. As with all platforms supporting this emoji update, the new hair options include a woman and man with red hair, white hair, curly hair, and no hair. Above: New hair options coming soon to Windows 10. The list of 157 new emojis for 2018 was published in February 2018 and approved alongside Unicode 11.0 in June. As with all Windows Insider builds, designs included in this release are subject to change prior to final release. This update is rolling out now to Windows Insider users, and is expected in the coming months for all eligible Windows 10 users.